MOOCs—massive open online courses—are undeniably popular in educational circles, and predictions are that they might just revolutionize how learning takes place. Gathering considerable media attention and investor interest, new MOOCs from groups like Udacity and Coursera seem to be taking the world by storm with hundreds of thousands of students enrolling and big name universities signing on. But are MOOCs just a passing trend or are they truly something that could change the face of education? 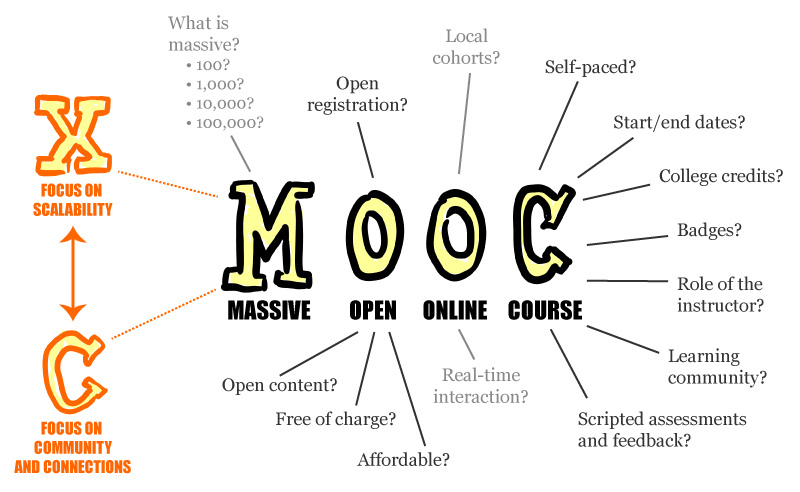 Do these new MOOCs—called xMOOCs by some—represent the best MOOCs can offer? And how might MOOCs affect K-12 learning? It’s worth taking a brief look at the history of MOOCs. While MOOCs have gained considerable traction in the last year, they aren’t as new as you might think. The term was first coined by Dave Cormier and Bryan Alexander in reference to the 2008 course, “Connectivism and Connected Knowledge,” that was facilitated by George Siemens and Stephen Downes in partnership with the University of Manitoba. The first MOOCs—sometimes called cMOOCs—were very connectivist. That is, they fostered deep participatory learning with facilitators and learners engaging as peers. The work in these cMOOCs involved authentic, project-based activities like blogging and project creation. The early MOOCs were generally open in every respect. They were open to anyone to enroll, free of charge. They existed in open web spaces, not behind password-protected firewalls. They were often licensed under Creative Commons or similar licenses that permitted the free reuse and redistribution of content by others. Some cMOOCs were large, but they were not “massive” in terms of having hundreds of thousands of enrollees. This can be contrasted with the newer xMOOCs, which take a different approach. In part because they serve thousands of learners in a single cohort, they tend not to foster rich connections between facilitators and learners. They often make use of traditional content delivery mechanisms, such as video-based lectures and machine-scored assessments. Many of these xMOOCs are not “open” in all the senses. Some are built on commercial, “all rights reserved” content. Because they are often envisioned as commercial endeavors, most exist behind passwordprotected firewalls and coursework is not publicly viewable. The business models of xMOOCs are not always readily apparent, but they include the possibility of selling proctored assessments and/or formal credit, as well as leveraging student analytics to sell data to third parties, such as potential employers. These newer xMOOCs do represent a fundamental change in certain aspects of education. Their success has challenged many universities to look at online learning in a way they haven’t before, and they have opened up free learning opportunities to some who haven’t had access in the past. However, they fall short of the promise of cMOOCs in terms of offering new and hopefully better ways to learn. As a result, some educators have concerns about these xMOOCs. However, they do not represent the only flavor of MOOCs. So are cMOOCs a thing of the past? Not at all. In fact, there are many shining examples of cMOOCs that are thriving, sometimes under the radar. One example is DS106, the Digital Storytelling course originally created and offered by the University of Mary Washington in Fredericksburg, VA, and now spread to participants around the world. DS106 is offered as a face-to-face course for credit at the university, but is also open to participation by anyone online. The curriculum of DS106 allows students to choose their work from an open assignment bank to which all participants can contribute. The assignments include audio, video, and photography projects that students create and then share through a unique model of network aggregation. Designed for educators, #clmooc was focused on the ideas of creating things and the do-it-yourself ethos of the Maker Movement. It was open to anyone interested in making and creativity and learning, and the entire experience was grounded in Connected Learning principles. The collaboration was open in all respects—free to anyone to participate, on the open web, and open licensed with a Creative Commons Attribution (CC BY) license. Look for MOOCs that have actively engaged facilitators and that emphasize peer learning and community. Evaluate the content and how it will be delivered to ensure that it meets your learning style and needs. Seek courses that are truly open—open to all learners, on the open web, and open licensed (preferably with a Creative Commons license). Think about the motivations of the group behind the MOOC. Look at their website, and read the terms of service to see how your data might be used. Seek to build community with others in the MOOC. In peer learning, we sometimes learn more from each other than from packaged content or instructors. Advocate for yourself and your learning. If a MOOC (or any other learning experience) isn’t meeting your needs, see what can be done about it or move on without regrets!